Fine Art Portraiture ~ Printed and Framed! We love our fine art portraiture and we love it printed and framed! When we create our fine art portraiture we begin at the beginning and we end at the end. The beginning is learning about who are clients are and how we can make them happy. As we plan the session we think about colors and textures. We think about character, personality and style. We put this all together and then forget about it while we enjoy a fun session together. Then we think about the design elements all over again as we select the final poses and plan the display. We love our fine art portraiture and we love it printed and framed and displayed on a wall. We are committed to carrying the creative process through until the end and we believe the end is as important as the beginning. The colors and textures and personality and character that we lovingly captured is best appreciated on a material that expresses these design elements and gives them the emotional impact they deserve. 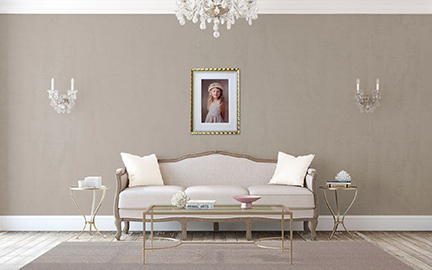 A beautiful portrait is a treasure when it’s matched to a rich watercolor paper, gelatin silver print or canvas. And the end? The frame. 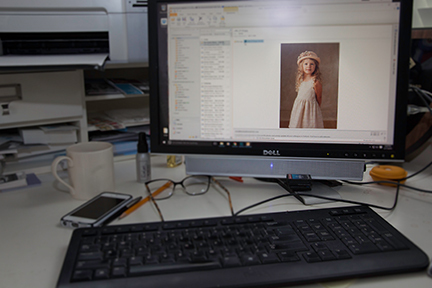 We are back to selecting colors and textures, character and personality and style to match our precious portrait. 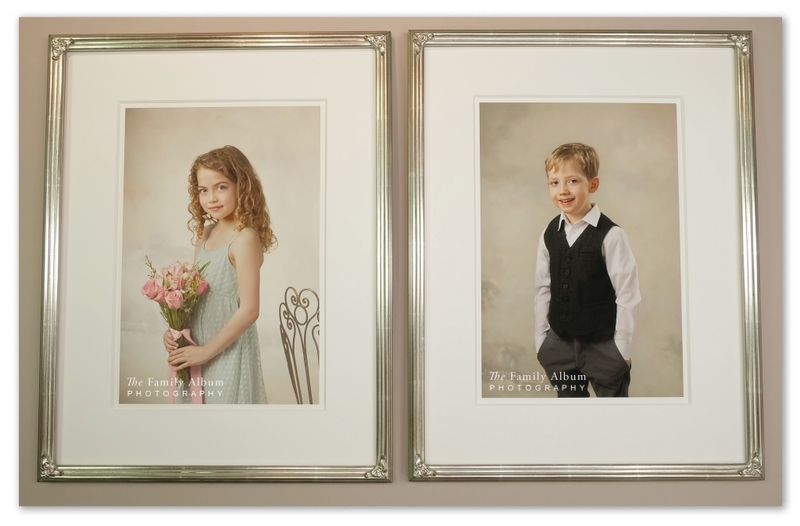 The frame becomes not only the holder and protector of our fine art portraiture but also an extension of the fine art. Digital or print? We’ll take printed and framed – thank you! She was dressed in a simple textured cream dress and straw hat; we captured her dreamy side. And those blue eyes and wavy blond hair! We had the portrait printed on the 100% pure cotton rag paper and brought it to Walden Framer because we knew he would get it. He did. 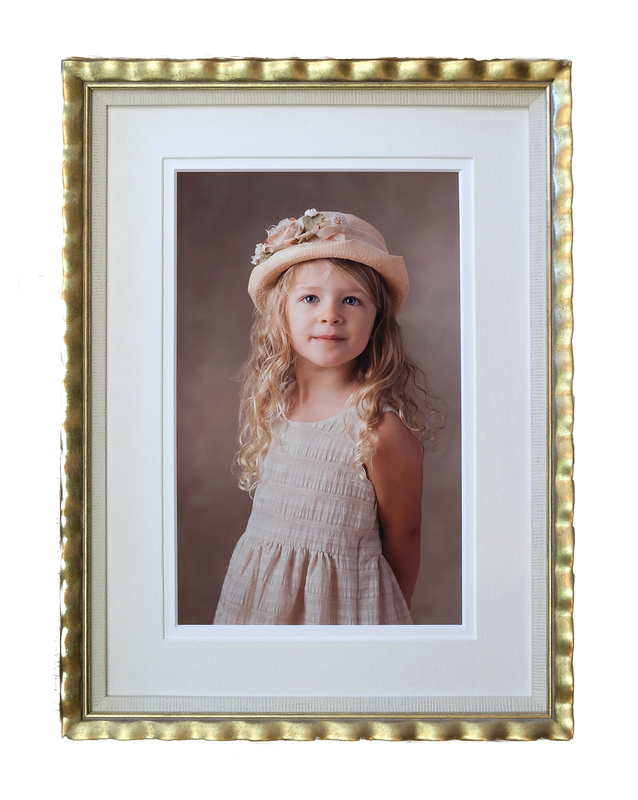 The wavy hair, textured dress, woven hat, purity, sweetness…….Wavy gold frame, textured filet and linen mat…. framing perfection. What about the little treasures. Those small and deep and intimate? Like the youngest children thinking their youngest children’s thoughts? We love those too. They have their own look, like black and white printed on gelatin silver paper. And did Walden Framer get that too? 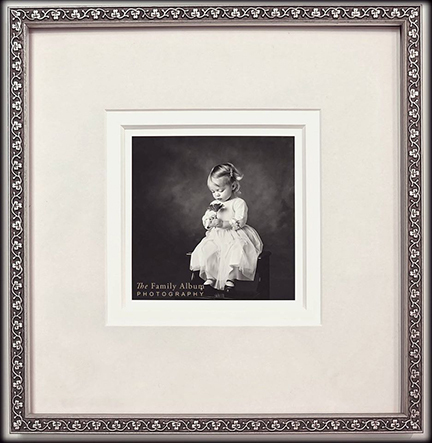 A Fawn White Suede mat over an 8-ply Antique White and the most delicate treasure of a frame. We think so! A little more formal, a little dressier a bit more classic for the dining room please? Brother and sister watercolor prints. We created the artwork and Walden Framer provided the fine wine. White gold finished corner frames with applique corner elements. When only the best will do. It’s love it’s technique it’s dedication. It begins at the beginning and it ends at the end. We value our fine art portraiture and we love it printed and framed.